PLEASE NOTE: The Thurman Maple Sugar Party, traditionally held on the first Saturday of our three-weekend event, had to be canceled this year due to a problem with town hall facilities. Please show your generosity to the American Cancer Society this year with a direct donation. Thank you for your support. Three glorious weekends offer you a chance to celebrate the start of spring and the end of cabin fever just 15 minutes from Lake George! The event features 5 maple farms, including the four largest producers in Warren County (Hidden Hollow, Valley Road, Adirondack Gold, Toad Hill) and a new one, Mud St. Maple, making a name for itself with their passion, hard work and innovative products. Several neighboring farms with varying products complete the picture, making this a must-do event, in Thurman, where nature is a way of life, and sugaring is second nature. Watch sap being gathered and boiled and see how Martin’s Lumber and Certified Tree Farm makes maximum use of the wood from its trees, and spend time at the Artisan Market they host there. Visit Nettle Meadow, an internationally-awarded farm and goat/sheep cheese dairy. Stop in at Whitefield’s and Blackberry Hill Farms that produce all-natural and/or certified organic products and take a cooler to transport some home. Enjoy a whole day of fun activities, demonstrations, wagon rides, sampling and shopping for delectable goodies, 10 a.m. – 4 p.m. each day. Like pancakes? Pancake breakfast or brunch at Valley Road Maple Farm is available each day, beginning at 9 a.m. and running until 1 p.m., so you won’t have to miss a minute of tour time. Big news this year: Valley Road will add gluten-free pancakes to this year’s menu, created by New Hope Mills, the same company that makes the mix for their regular pancakes. Find rack cards with mini-map at each site, at Thurman Town Hall entryway, and around the region, or pre-plan your day by downloading our printable map and passport, available here. Many visitors navigate by GPS readings, and others just watch for farm signposts, follow their noses or simply ask a friendly resident, but you’ll want a passport so you can enter our free prize basket drawing. Did you miss our 2019 Maple Days? We’re so sorry! We had a wonderful turnout of guests who braved wind, cold, snow and mud as we ushered in spring. They toured, took hay rides to the sugar bush, shopped, visited farm animals and shopped for a wide variety of foods–from fresh maple syrup (sometimes on pancakes! ), a host of maple confections to internationally-awarded goat and sheep cheese, souvenir clothing, pottery, jewelry, soap, candles, wooden wares, hand-crafted art for the home, organic poultry, jams and bread, all-natural pork and more.We hope you’ll visit Thurman for Martin’s annual “Woods Walk and Artisan Market, the free summer concert series, and the Fall Farm Tour (dates and details on this web site). Also, please note the dates of next year’s three weekends of Thurman Maple Days — March 14-15, 21-22, and 28-29, 2020. Bring the whole family to visit all the sites! Watch maple syrup being made before your eyes. Our maple farms – including the following farms and more: Hidden Hollow Maple, Valley Road Maple, Toad Hill Maple, Mud Street Maple, Adirondack Gold Maple, Peru Llama, Whitefield’s, Windy Ridge, Blackberry Hill, Martin’s Lumber, Nettle Meadow – all are in the same business, but differ in many respects, so plan to visit them all. You’ll see syrup, maple sugar, maple peanuts and candies being made, as well as maple tea and coffee and souvenir clothing items. Wonderful maple treats will tempt your palate, and special activities will fill your day with fun. Sugarhouses will open their doors for touring and tasting, sampling and shopping. Sugar producers Mike Hill and Ralph Senecal host breakfast each morning beginning at 9 a.m. maple sausages from Oscar’s, hot, fluffy pancakes (both regular and gluten-free) with pure maple syrup drizzled over the top! MMmmmmm. They’ll keep flipping flapjacks till 1 p.m. Tour the facility, too! Valley Road Maple boils in a state-of-the-art sugarhouse. They have expanded their operation to 3,400 taps on vacuum with reverse osmosis, producing syrup, cream, candy, sugar, maple roasted nuts, maple peanut brittle and maple cotton candy. Valley Road Maple won first place in the Vermont international maple syrup contest for light amber syrup and the 2008, 2009 and 2012, New York State Fair first prize for maple candy. Come see why! Gary and Wini Martin have a Certified Tree Farm with a portable bandsaw mill producing live edge lumber. Weather permitting, there will be demonstrations of the mill or the forge. Martin’s is also the home of Lucyann’s Paper Bead Jewelry, featuring custom orders from wedding invitations or birth announcements. Set up where it is warm will be crafted items from the live edge lumber, stained glass stepping stones and paper bead jewelry, along with friends and neighbors displaying their art: handmade cold process soap, body butter, body butter sugar scrubs, lotion bars, lip balm and bath balms, pottery including a special line crated just for Thurman Maple Days, wood fired maple syrup and homemade jams, 3D hand crafted greeting cards, one of a kind 3D collage art created from treasures found on the forest floor, wood burning, and a master gardener with information on house plants and starting seeds indoors. Throughout the day are demonstrations and hands on activities. Nettle Meadow farm and Sanctuary will offer hourly farm tours (weather permitting) and an indoor cheese tasting (try our new chevres!) if the weather is bad, and will be selling their cook booklets, telling about their nationally and inter-nationally-awarded cheese*, the animals, and the history of the place, along with the recipes. On March 16-17, two treats: Ask for Maple Jack Wax goat cheese ice cream, and, in honor of St. Patrick’s Day, Irish soda bread served with their new maple butter. Visit the new lambs and kids at their new new mini-barn on the property (as long as its not too brutally cold for them to come out in the sun). Four boy baby goats will be up for adoption almost ready to wean as well. They’ll be free to great homes. Land at this site has been farmed since John Thurman deeded acreage to the Johnson family, which founded Meadowbrook Stock Farm and ran it for generations. Nettle Meadow is now primarily a goat farm and artisan goat and sheep cheese shop. See, sample and shop their gourmet goodies. See the restored historic barn loft and the cheese shop! During Maple Days, enjoy their three flavors of maple goat cheese ice cream – plain maple, maple chocolate chip, and maple blueberry! Nettle Meadow’s Kunik was awarded World Champion Cheese Contest and won first place, along with Apple Cider Fromage Frais cheeses in Madison, WI, competing against cheesemakers from across the US, and Canada, Switzerland, Germany and other countries around the world. Here third generation maple producers operate an old fashioned sugarhouse. They have 1200 taps (1100 with tubing and 100 in buckets) and a 2′ x 6′ wood-fired stainless steel evaporator. Come browse the Kenyons’ full line of maple products–coffee, tea, cotton candy, cookbooks, and maple donuts–to get your “maple fix” and stock up on gifts for the year. Family activities are planned at Adirondack Gold Maple Farm for both days of each weekend. “Tapper” will show the kids how to tap, gather sap and boil it. 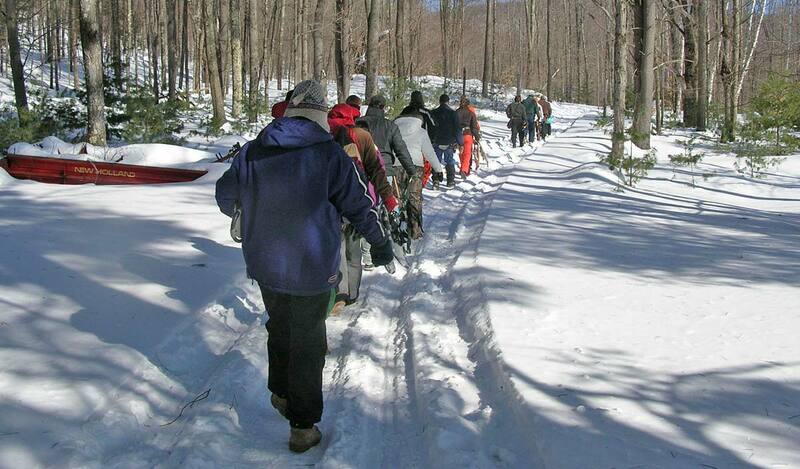 Bring snowshoes to go visit Tapper’s lean-to, snow permitting. Test your taste buds with different syrups to see if you can discriminate between grades, and between what is real and what is artificial. 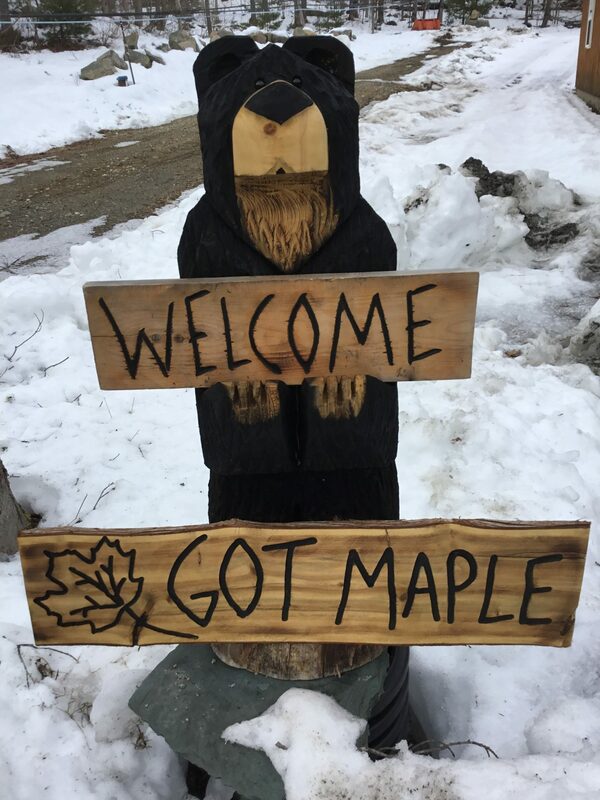 Adirondack Gold offers maple recipes, to show you that maple syrup isn’t just for pancakes anymore! Whitefields raise all natural cage-free chickens, turkeys, ducks and geese, and sell all natural, fresh brown eggs. They will offer sausage samples, tours of the barn and processing area. If weather permits, enjoy a tractor wagon ride around the farm. Note that they are able to be open only March 23-24. Blackberry Hill Farm is a diversified family farm that has earned certified organic status from the USDA and NOFA NY. They offer vegetables and herbs; when in season) also certified organic chicken, turkeys and non-GMO heritage breed pigs. This time of the year it’s pretty quiet at the farm but they are gearing up for spring and our spring litters. Weather/mud permitting they will have farm tours although it’s too cold for the baby chicks and piglets. Stop by the farm stand to see chicken (whole, breasts, drumsticks), turkey, pork (sausage pork chops, roasts), eggs, jam and more . Pack your cooler and take home some of the best tasting meats in the county! Three generations of the Wallace family work together to produce pure Adirondack maple syrup, maple cream, delectable maple candies, and many specialty products such as maple jelly, cinnamon maple sugar. maple pepper and much more. Old meets new in this operation, with a traditional wood-fired evaporator processing sap already reduced by reverse osmosis. The Wallaces have expanded their operation to over 5,000 taps. Like Hidden Hollow Maple Farm on Facebook. Looking to Spend the Weekend? Make your lodging reservations today at The Glen Lodge, Thurmans’s riverside B&B with Adirondack Great Camp ambiance. Thurman Maple Days are made possible, in part, by funding from Warren County occupancy tax dollars granted by the Town of Thurman through the auspices of Thurman Station Association.